Hello Nueltechers , Hope you are all still flexing your Airtel 0.0kb free unlimited tweak? , well i'm still flexing it on a lowkey and With this new launched VPN called Stark VPN, you will now have access to unlimited data. Unlike tweakware Vpn that has daily limit in free servers and this Stark VPN is very fast, reliable and can be used on smartphones with low RAM and doesn't consume alot of battery like psiphon. It is very fast and bug fixed. A user can use Unlimited Data without any daily limit. It is very easy to use as all free browsing settings are always configured on the VPN automatically. Your connection is always secured and protected. It doesn't consume alot of battery even with the simple interface. 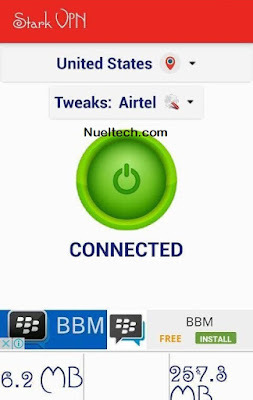 It can be connected on Smartphones with low RAM without lagging or being slow. It has many free servers in different countries like United state, London, England and Canada. This VPN can be used on many free browsing depending on any free browsing that is out or available, it will be updated automatically. So Download Stark VPN on playstore by clicking here.